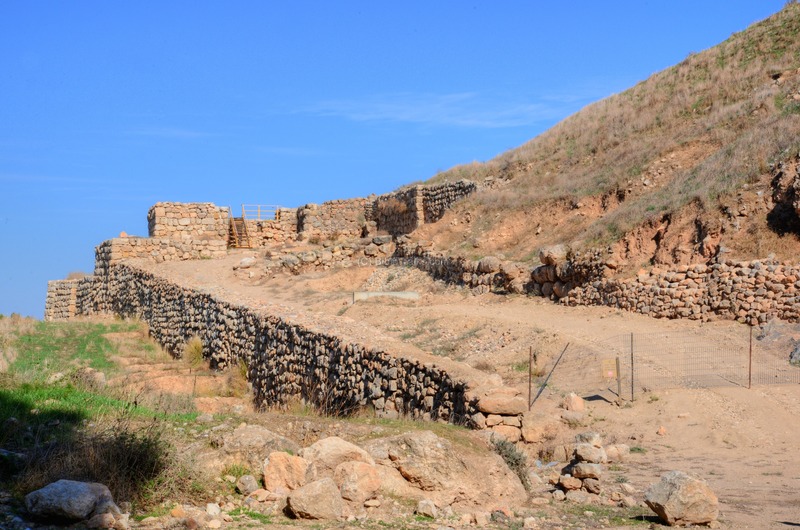 The second most important fortified city in the kingdom of Judea, guarding a main road from Egypt to Jerusalem. 2 Chron. 32 9: "Sennacherib ... laid siege against Lachish". 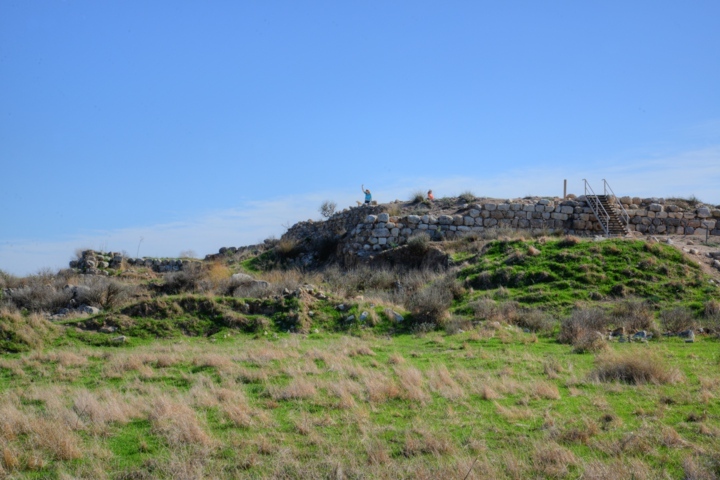 Lachish was the second most important fortified city in the kingdom of Judea, after Jerusalem. It guarded a main road from Egypt to Jerusalem. Lachish is referred in many Biblical accounts, including the Assyrian and Babylonian campaigns when Lachish was a key city for the conquest of the Judean Kingdom. 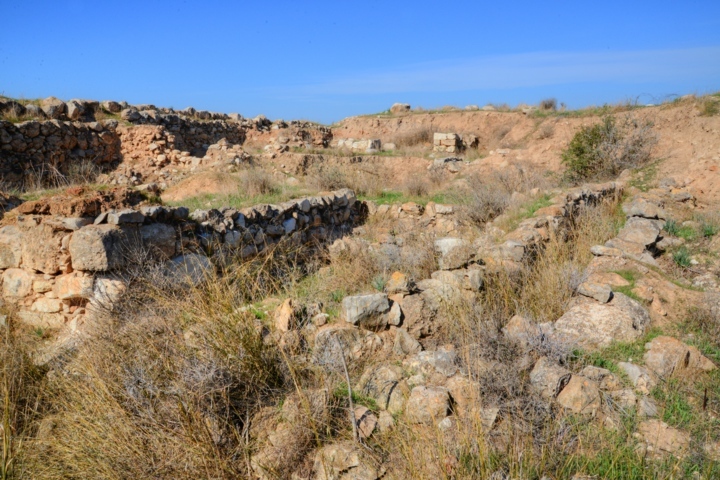 The highlights of the visit to the ruins of the city include the Assyrian siege ramp, the base of the Judean palace-fort, and the gate complex. Tel Lachish is adjacent to Moshav Lachish, 9KM southeast of the city of Kiryat Gath. 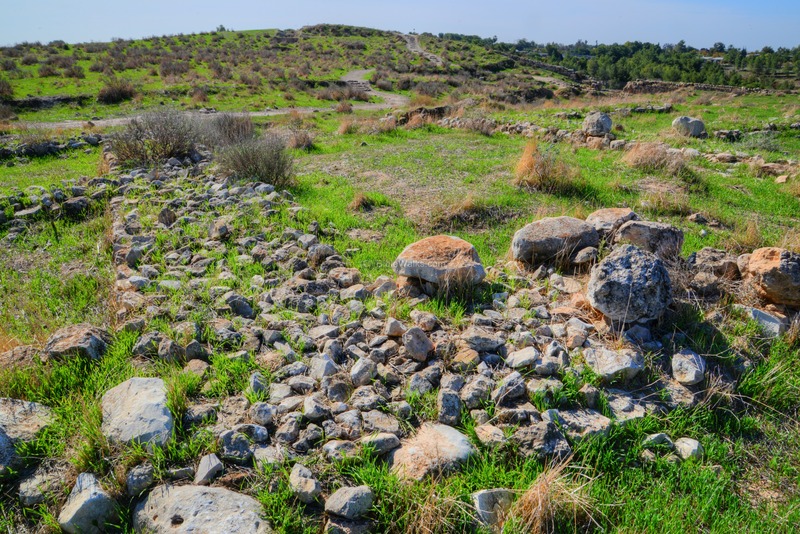 It is located in the foothill region of Judea (the Shephelah), hidden between low hills near the valley of Nahal Lachish (Wadi Ghufr). 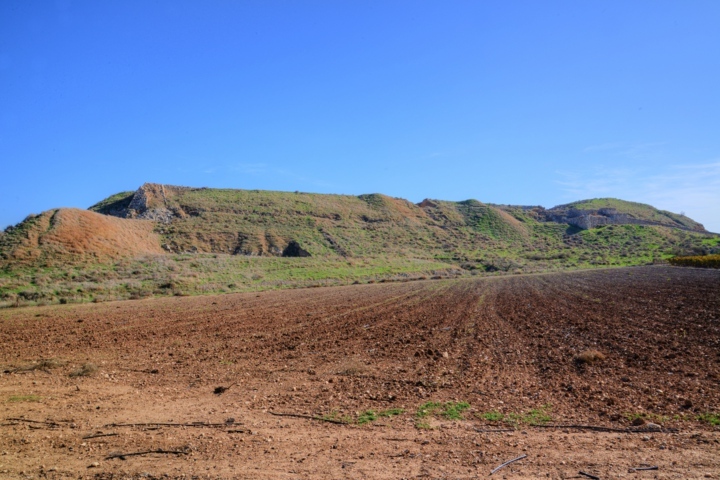 The mound is surrounded by deep valleys, providing a natural defense. The top of the ancient site is 273m above sea level, or 50m above the valley on its north side. The access to the top of the mound is on the south side, where you can park your car. A path climbs up along the east side to the top of the hill, and then you can return back from the western gate. 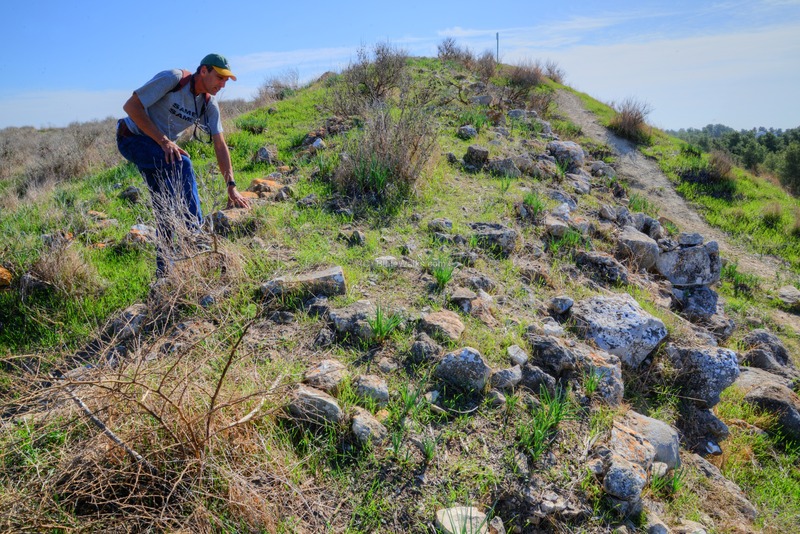 The earliest remains found in Tel Lachish belong to the Neolithic period (8300-4500 BC). 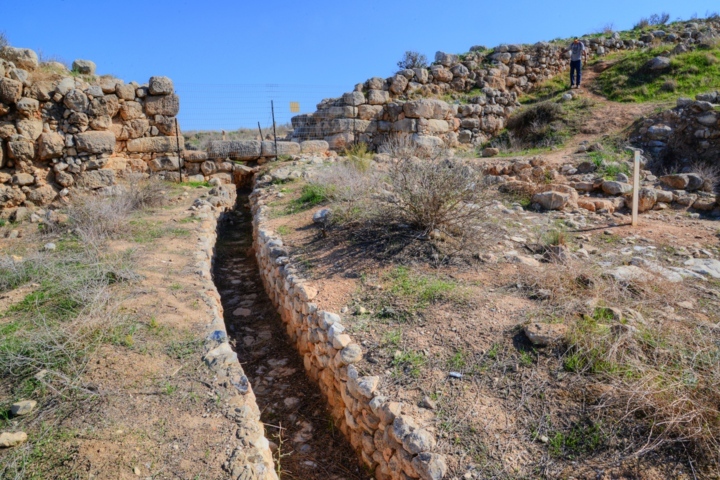 A small settlement was established on the top of the hill during the Early Bronze age (3150 - 2200 BC), which grew in size and perhaps was also fortified towards the end of the Early Bronze age. During the 13th and 12th C BC (Late Bronze Age) Lachish enjoyed great prosperity under the Egyptian rule. It covered the entire area of the summit and some of the slopes, but was not fortified. The city state of Lachish controlled a large territory (estimated at 990Km2) and dominated two dozen of satellite sites. 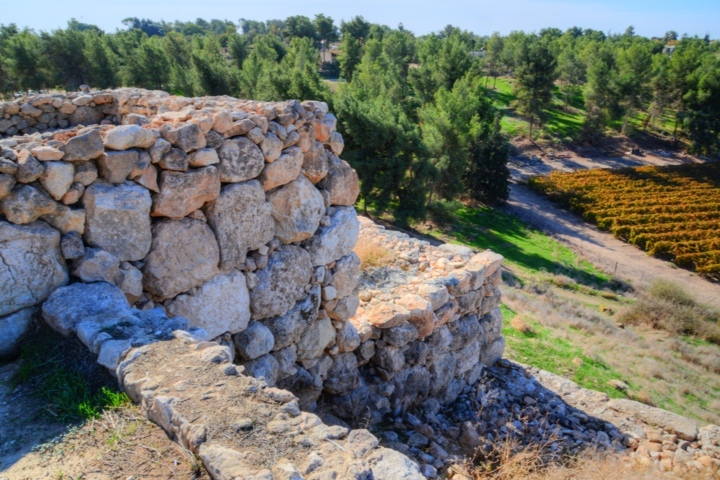 Lachish was one of the most prosperous cities in Canaan, and it traded with other countries in the region. At the middle of the 12th C BC (1140-1130) the city was totally destroyed, razed to the ground, and its population was exiled. This destruction may have been by the Israelites, as attested by the Bible, or by the Sea Peoples (later: "Philistines"). 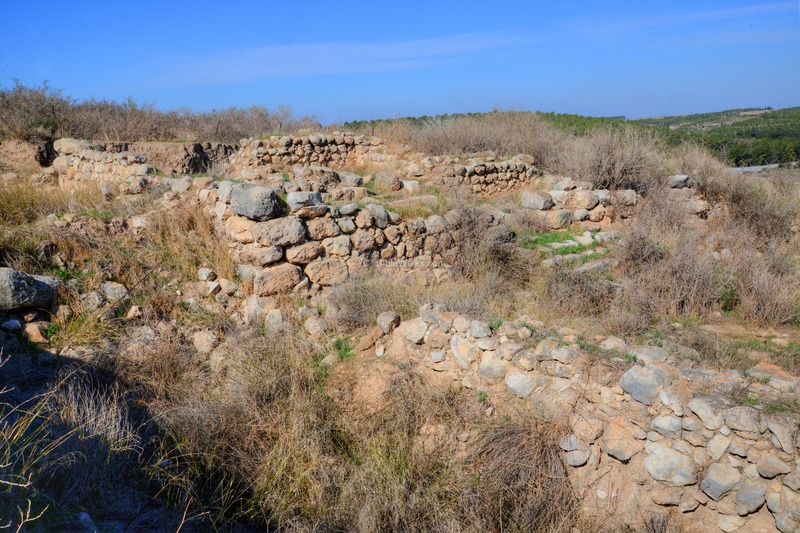 Lachish was then abandoned for two centuries. 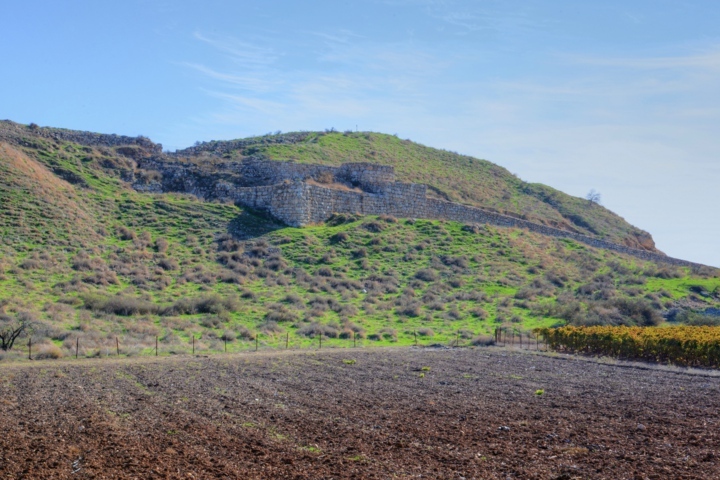 Lachish was one of the Canaanite cities, who fought against Joshua in the battle of the Amorite Kings coalition. The coalition attempted to block the invading Israelites after their victories in Jericho and Ai. The kings decided to punish Gibeon, a Canaanite city which signed a peace agreement with Joshua (Joshua 10 5): "Therefore the five kings of the Amorites, the king of Jerusalem, the king of Hebron, the king of Jarmuth, the king of Lachish, the king of Eglon, gathered themselves together, and went up, they and all their hosts, and encamped before Gibeon, and made war against it". Joshua chased the 5 Amorite kings down to Azekah. 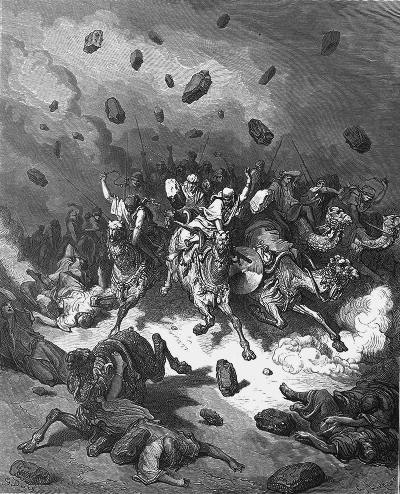 The Israelites slew the Amorites, and God casted great hailstones which destroyed them (Joshua 10 10-11): "And the LORD discomfited them before Israel, and slew them with a great slaughter at Gibeon, and chased them along the way that goeth up to Bethhoron, and smote them to Azekah, and unto Makkedah. The Israelites then conquered Lachish, wiping its Canaanite inhabitants (Joshua 10 31-31): "And Joshua passed from Libnah, and all Israel with him, unto Lachish, and encamped against it, and fought against it: And the LORD delivered Lachish into the hand of Israel, which took it on the second day, and smote it with the edge of the sword, and all the souls that were therein, according to all that he had done to Libnah." 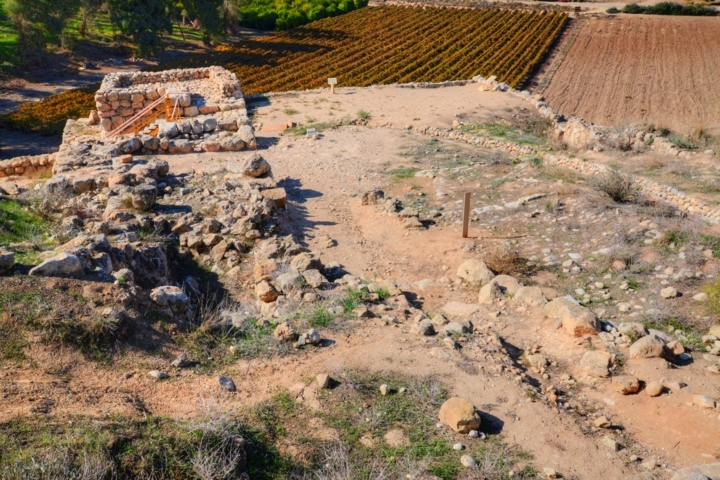 The city of Lachish is also listed as one of the conquered cities (Joshua 12 7, 11): "And these are the kings of the country which Joshua and the children of Israel smote... The king of Jarmuth, one; the king of Lachish, one;...". Cities and roads during the Canaanite and Israelite periods are indicated on the Biblical Map below, with Lachish on the left bottom side, which was the frontier of the kingdom of Judea during those periods. King Amaziah, son of Joash - found refugee in the city in 767 BC after his defeat to the Northern Kingdom (2 Kings 14 13, 19; also 2 Chronicles 25 27-28): "And Jehoash king of Israel took Amaziah king of Judah, the son of Jehoash the son of Ahaziah, at Bethshemesh... Now they made a conspiracy against him in Jerusalem: and he fled to Lachish; but they sent after him to Lachish, and slew him there". The Assyrian army came in 701, leaded by Sennacherib, son of Sargon II (2 Chronicles 32 1): "After these things, and the establishment thereof, Sennacherib king of Assyria came, and entered into Judah, and encamped against the fenced cities, and thought to win them for himself". They camped near Lachish (2 Chronicles 32 9-10): "After this did Sennacherib king of Assyria send his servants to Jerusalem, (but he himself laid siege against Lachish, and all his power with him,) unto Hezekiah king of Judah, and unto all Judah that were at Jerusalem, saying, Thus saith Sennacherib king of Assyria, Whereon do ye trust, that ye abide in the siege in Jerusalem?". A detailed illustration of the siege of Lachish appears on an Assyrian relief sculpture from the capital city of Nineveh, which is displayed in the British Museum (room 10b). It shows siege ramps that rose up to the walls of Lachish, troops with various armory climbing up to siege ramps to the walls, battering ram penetrating through the walls, capturing the city and enslaving its defenders. 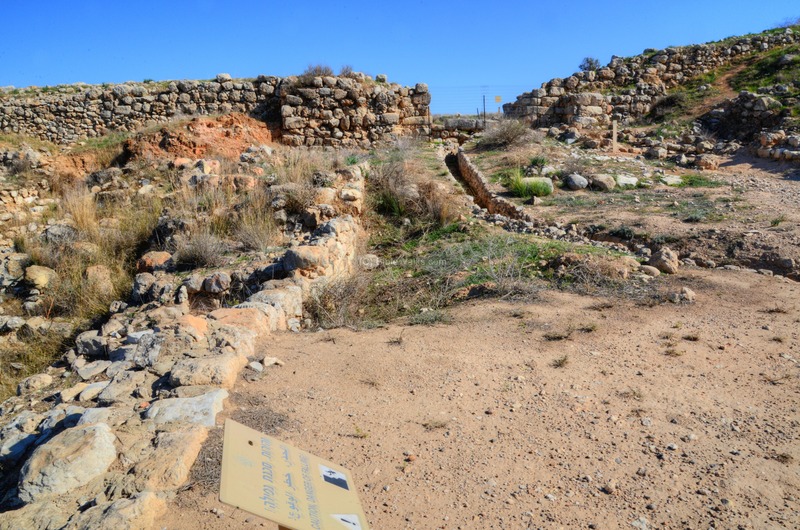 Remains of the siege ramp are evident on the southwest corner of the city, and the thoroughly excavations found evidences of the fierce battles along the ramp. According to an Assyrian clay tablet, Sennacherib conquered 46 cities in Judea, including Lachish. Micah, the prophet at these tragic times, warned Judah that the fate of Lachish was a result of their sins (Micah 1 13): "O thou inhabitant of Lachish, bind the chariot to the swift beast: she is the beginning of the sin to the daughter of Zion: for the transgressions of Israel were found in thee". 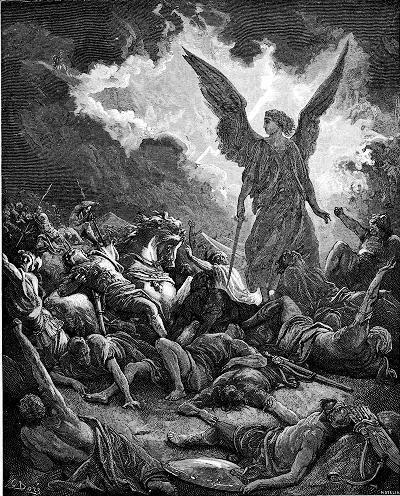 God spared Jerusalem from destruction and the Assyrians retreated (2 Chronicles 31 21-22): "And the LORD sent an angel, which cut off all the mighty men of valor, and the leaders and captains in the camp of the king of Assyria. So he returned with shame of face to his own land. And when he was come into the house of his god, they that came forth of his own bowels slew him there with the sword. Thus the LORD saved Hezekiah and the inhabitants of Jerusalem from the hand of Sennacherib the king of Assyria, and from the hand of all other, and guided them on every side". The Assyrians retreated (2 Kings 19 36): "So Sennacherib king of Assyria departed, and went and returned, and dwelt at Nineveh". Lachish remained destroyed until the end of the 7th C BC. It was then rebuilt, probably during the reign of Josiah (649-609 BC). However, after some time (589) Zedekiah mutinied, which brought Nebuchadnezzar to destroy the Judah kingdom completely. In this intrusion (587) most of the cities were leveled. 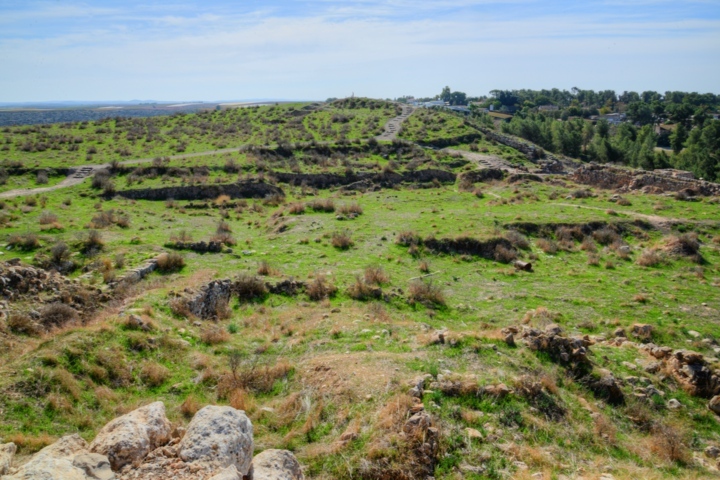 Close to the end, only Jerusalem, Lachish and Azekah were left fighting (Jeremiah 34 7): "When the king of Babylon's army fought against Jerusalem, and against all the cities of Judah that were left, against Lachish, and against Azekah: for these defenced cities remained of the cities of Judah". 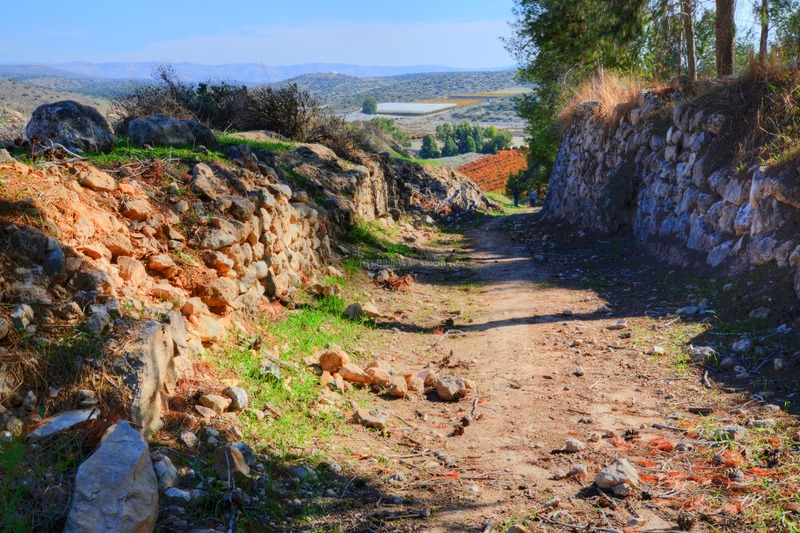 Azekah fell after some time, as documented in the Lachish letter (#4). Jerusalem followed in the summer of 587, and many of the people in the land were exiled to Babylon - thus bringing an end to the Kingdom of Judah. In 539BC the Persians defeated the Babylonians, and allowed the exiles to return to Zion (538 through 445 BC). 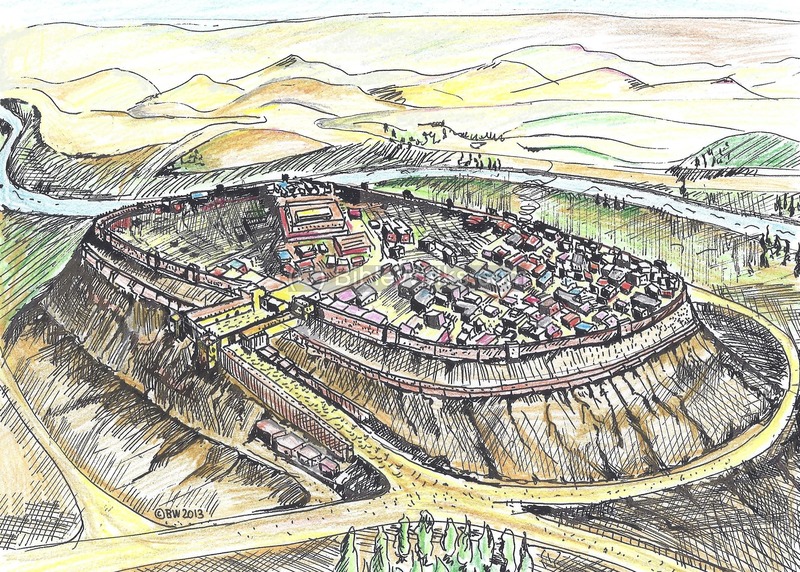 The cities were reconstructed, including Jerusalem and Lachish (Nehemiah 11 1, 30): "And the rulers of the people dwelt at Jerusalem: the rest of the people also cast lots, to bring one of ten to dwell in Jerusalem the holy city, and nine parts to dwell in other cities.... Zanoah, Adullam, and in their villages, at Lachish, and the fields thereof, at Azekah, and in the villages thereof. ". Following the end of the Persian period the city status started to decay, followed by a complete abandonment during the Hellenistic period. This was a common pattern of most of these ancient Tells. The location of this great city has been forgotten over the years. There were, however, many attempts to locate its ruins in the past 150 years. They failed to identify the Biblical site, and provided several suggestions (SWP, Vol 3, p 261): "Lachish: The site of this strong and important town is uncertain. In the 'Onomasticon' it is placed 7 miles from Eleutheropolis towards Daroma ; but no important site occurs at this distance...". 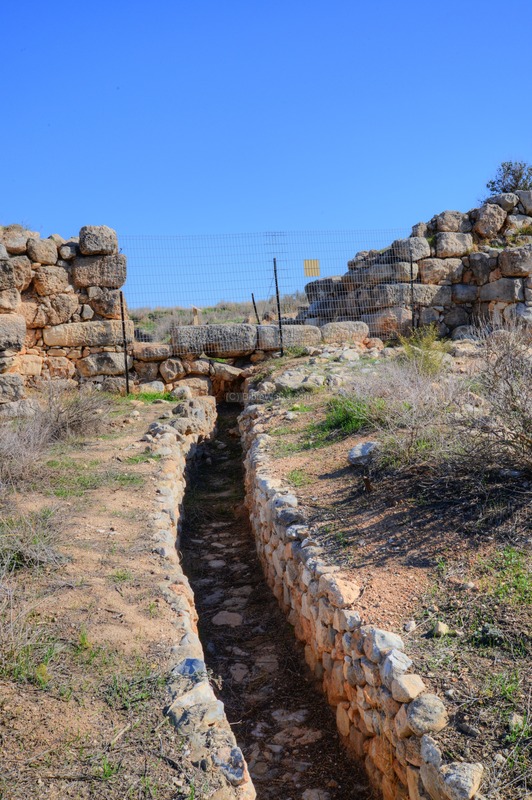 Years later, the Biblical site was firmly identified at Tell ed Duweir, in Wadi Ghufr, near the village of el Kubeibeh (esh Sherkiveh), on the road to Beit Jibrin. A section of the SWP map of the site is attached here. 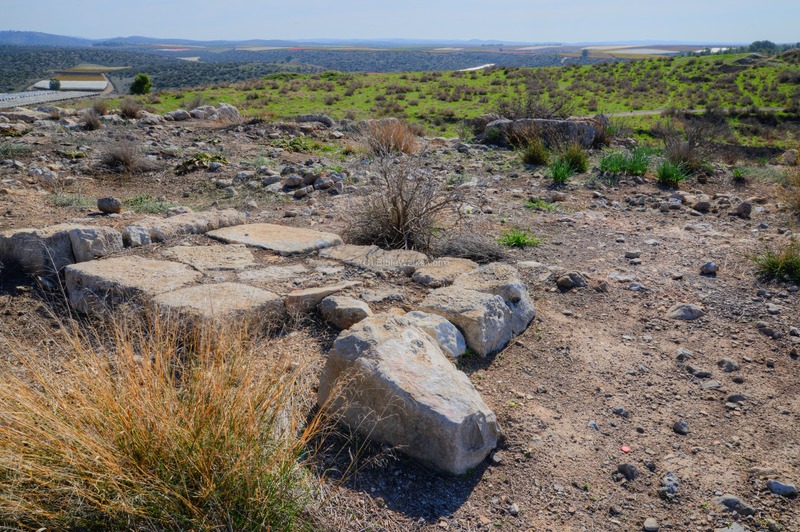 The distance to Eleutheropolis (Beit Jibrin) is 7km, shorter than the distance asserted by the Onomasticon, a Biblical dictionary of Biblical sites compiled by the Greek Eusebius. Their report on Tell ed Duweir (SWP, Vol 3, p 290) is merely: "A natural hillock, artificially scarped, with a steep slope. 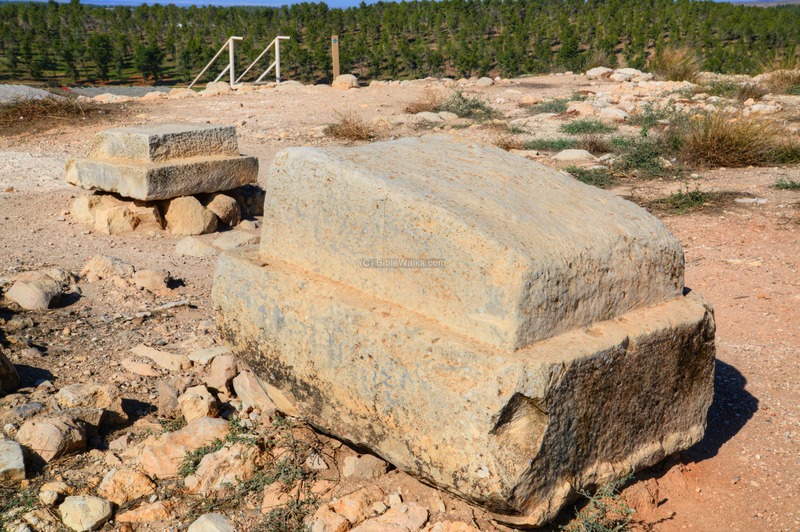 On the top are the foundations of a large square building". 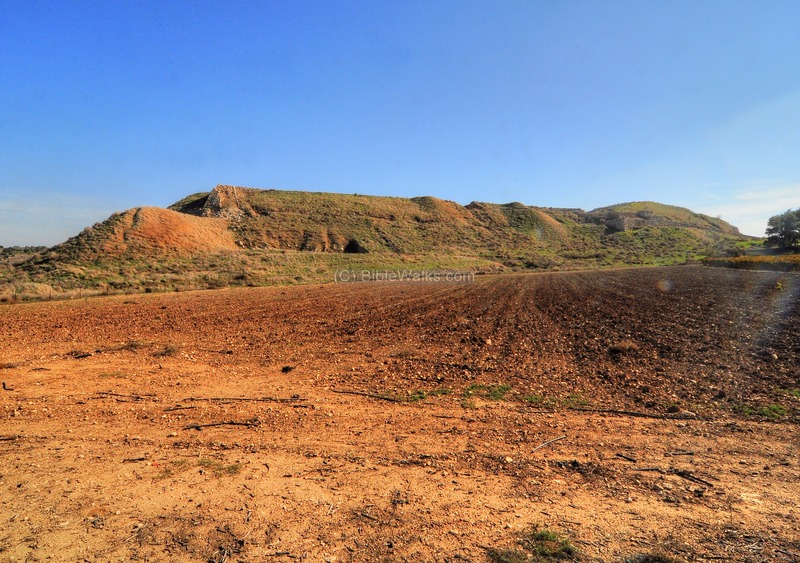 The scholars debated on the location of Lachish. 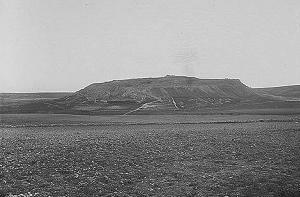 One of the prime candidates was Tell el-Hesy, as assumed by Conder and Kitchener, another Biblical site which was later re-identified as Gath. 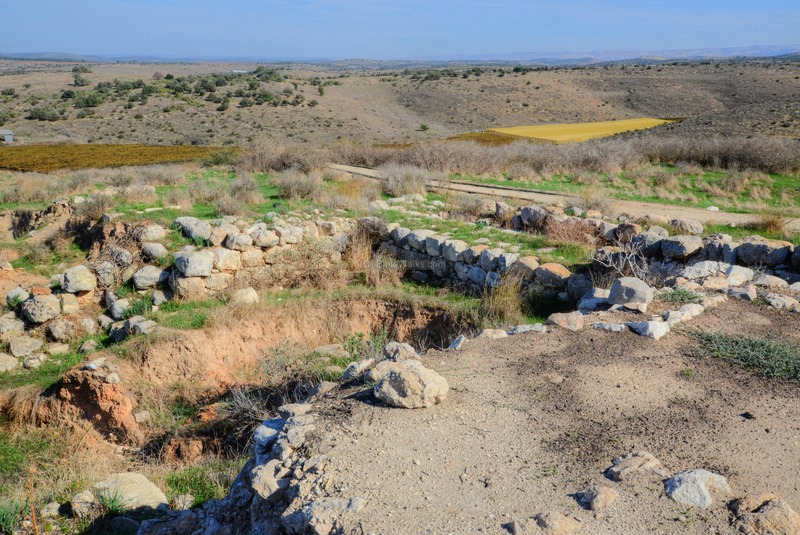 In the PEF annual meeting of 1907, Sir Charles Watson repeated their common theory: "a place called Tel el-Hesy, which is most probably the Lachish of the Book of Joshua". The first scholar who suggested Tell ed Duweir was in 1929 by the American archaeologist and ceramics expert W.F. Albright. 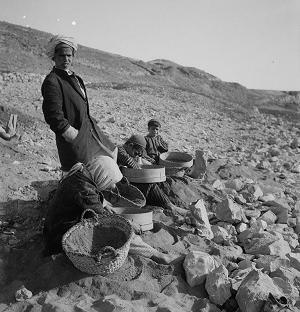 Excavations were first conducted by the Wellcome Archaeological Research expedition, headed by J. L. Starkey (1932-1938). His discoveries included the famous letters of Lachish, as well as the major sections of the city including the Canaanite "Fosse" temple (three temples, dated 1223-1400 BC), the "great shaft", dual city walls and city gate, the Persian "solar shrine" and residences from the Judean Kingdom periods. Starkey was murdered by a group of Arab militants when he traveled from Lachish to Jerusalem, thus ending the expedition. His assistant, Olga Tufnell, published the volumes of these early Lachish excavations. 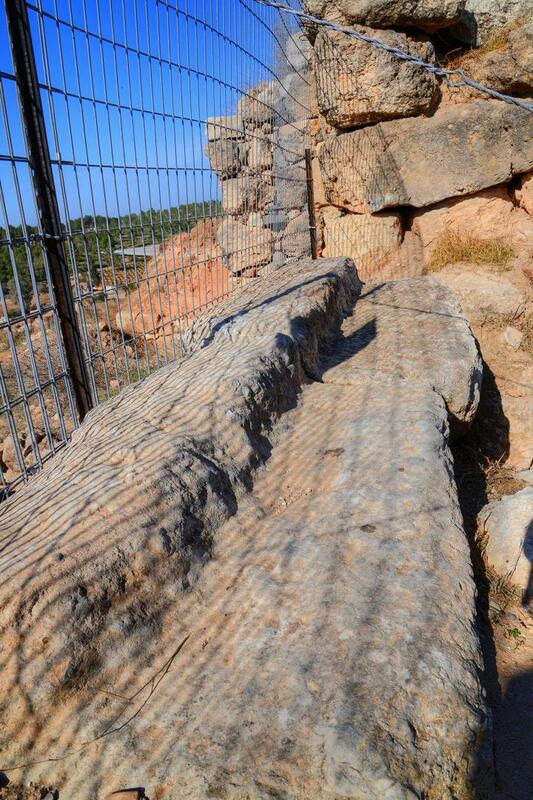 Another photo of the Starkey excavations shows a section of the supporting glacis wall for the city gate. Abundant traces of burning in dated to 587BC, when Lachish was destroyed by the Babylonians. 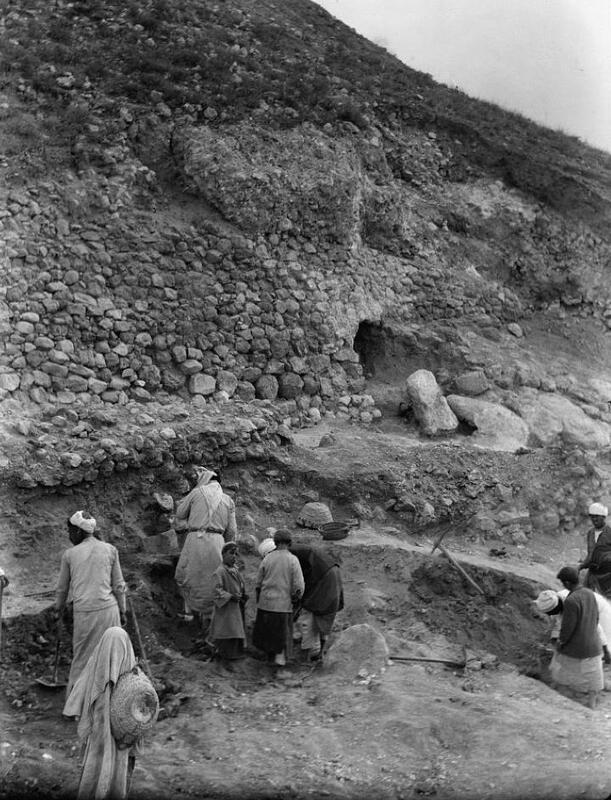 The renewed excavations were headed by Y. Aharoni (brief excavations in 1966 and 1968), followed with systematic excavations by the Tel-Aviv university team which were headed by D. Ussishkin (1973-1994). 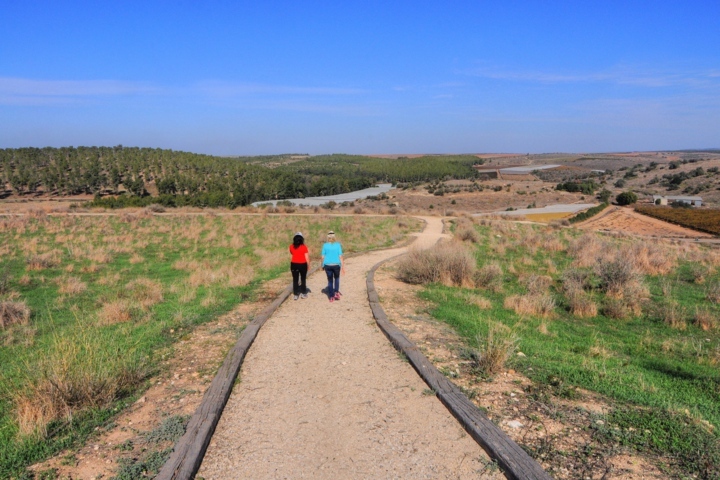 A moshav (agriculture village) was established in 1955 on the south side of Tel Lachish. It first started as a Kibbutz (collective community), then evolved to its present form. Most of its members grow and market grapes. A regional council of Lachish was established in 1956, managing a total of 16 villages. 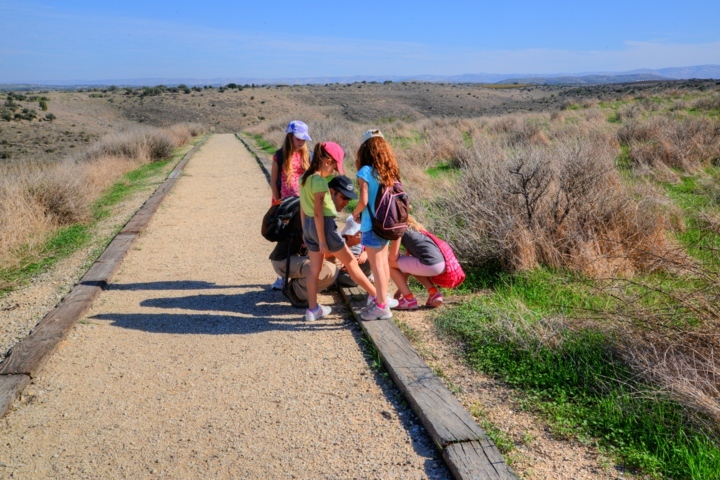 The site is National Park, which is open to the public since 1994. The top of the mound is nearly rectangular, with an area of 72 dunams (7 hectares). An illustration of the Judean Kingdom city during the 8th C BC (level III), based on the excavation data, is presented here from its south side. Lachish is located on a hill south of the valley. 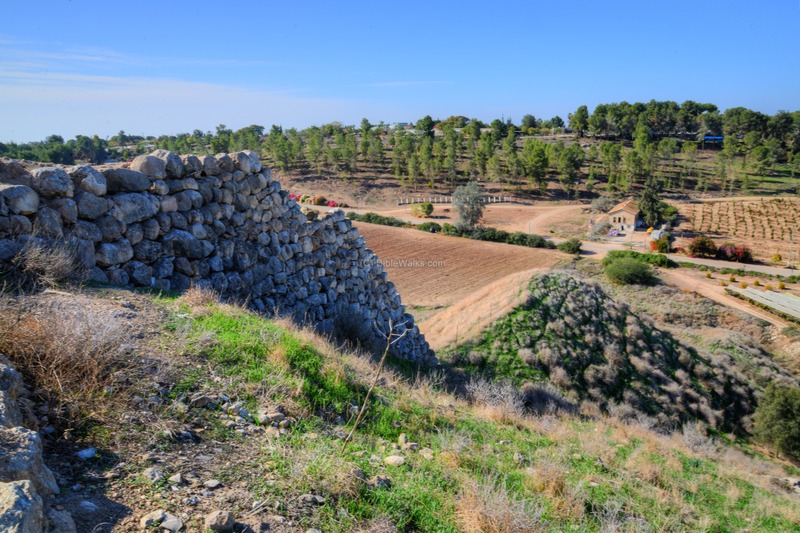 The city wall follows the top edge of the mound, with a mid-slope (revetment) wall supporting the foothills. Roads leading to the city enter through the south side. A massive gate complex on the west side is protected by towers in an area extending from the city wall. The main street inside the city continues from the inner gate to a monumental palace-fort, located in its center. The excavators identified the various levels of the site, as summarized in the following table. Tel Lachish is located on a low hill on the south side of Nahal Lachish (Wadi Ghufr). 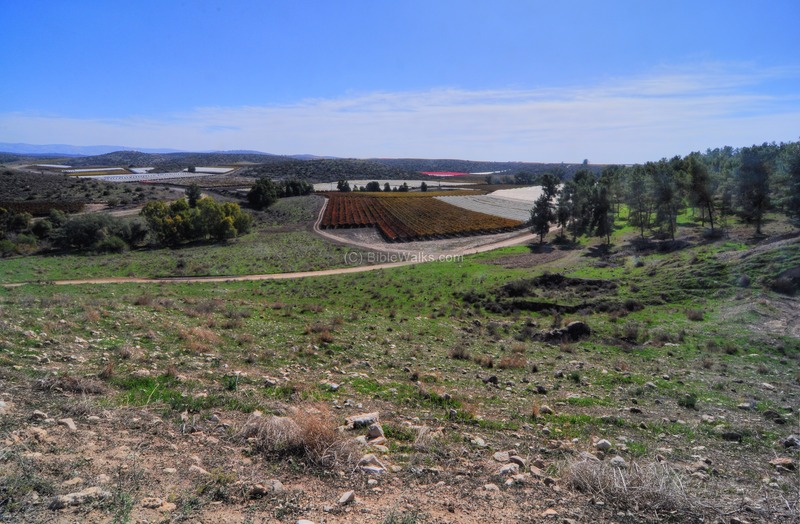 This west view is from the road to the adjacent Moshav Lachish (established 1956), a farming settlement named after the famous site. 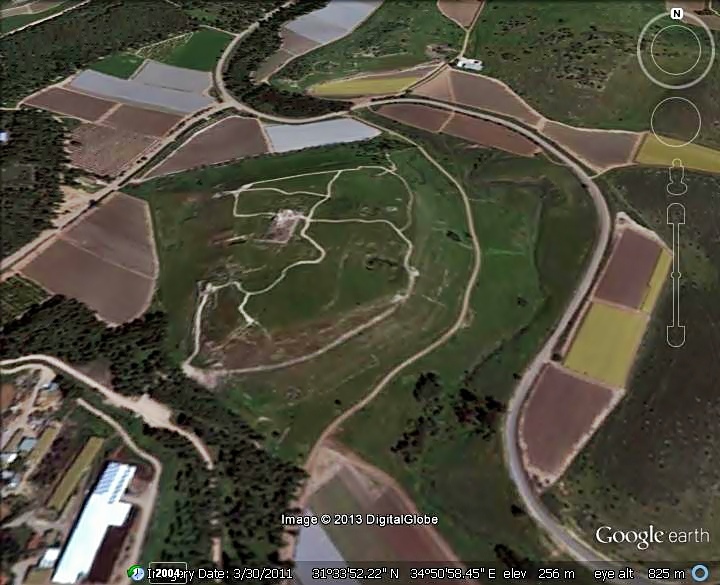 The following aerial view shows Tel Lachish above the same south west side. On the left side in this photo are the remains of the palace. The city gate complex is seen on the right side, on the external side of the city walls. A view from the east side of the Tel is in the following aerial view. New excavations are conducted now (July 2015) on the eastern walls, as seen near the large green tent. A new gate, first unearthed in the 2014 season, is the focus of this season. 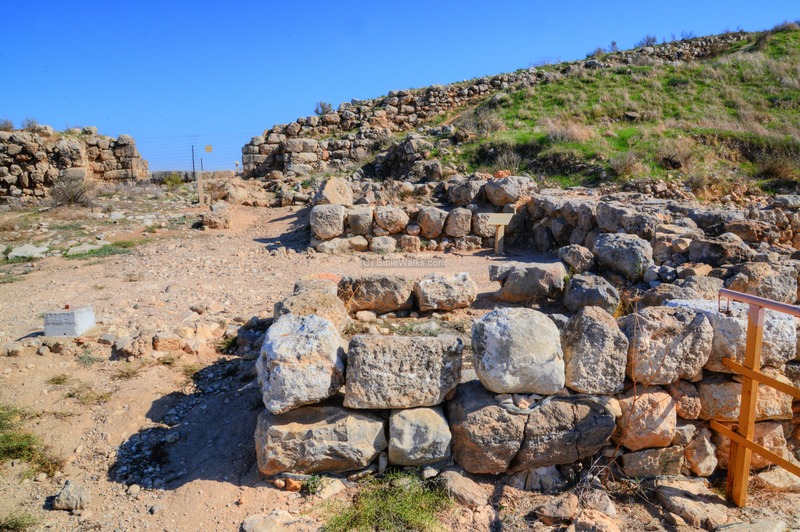 The following sections detail the major sites of Tel Lachish. 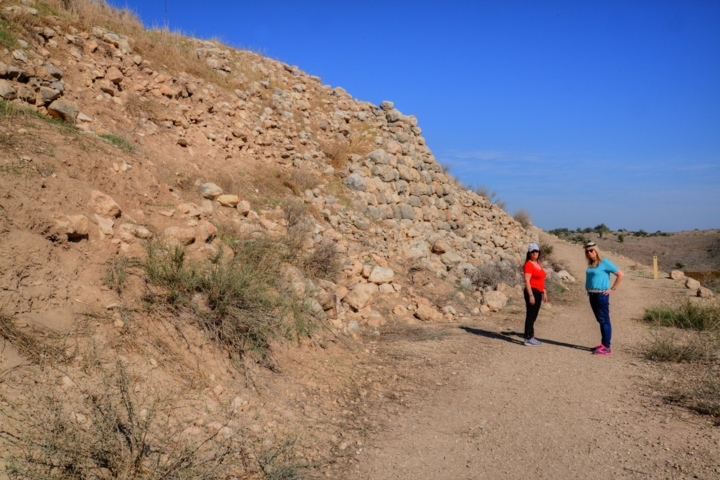 After parking the car on the south side of Tel Lachish, a modern trail leads up along the eastern foothills of the mound. The trail passes the mid-slope revetment wall, which supported the ramparts around the site. 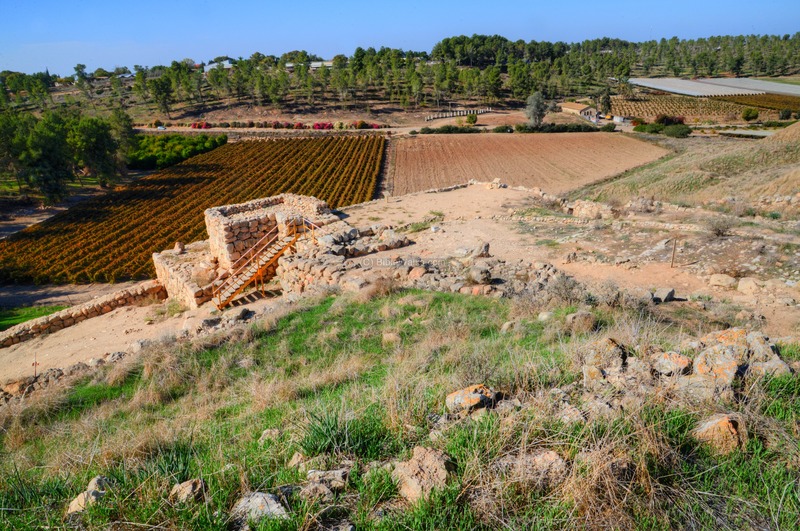 Around the area of Tel Lachish are vineyards, as Moshav Lachish cultivates and sells grapes and holds a substantial market share of the grape market (with their famous cooperative brand name of "Tali grapes"). (c) East side - "Solar Shrine"
A Hellenistic period temple was excavated on the east side of the mound. On its east side is a courtyard which is entered from the north-east corner. A pair of benches faced the entrance, and two store rooms on its southeast corner. A flight of stairs (seen in the center of this photo) lead up from the courtyard to rooms on the raised west side, followed by another set of stairs that lead into the inner room on the west end. 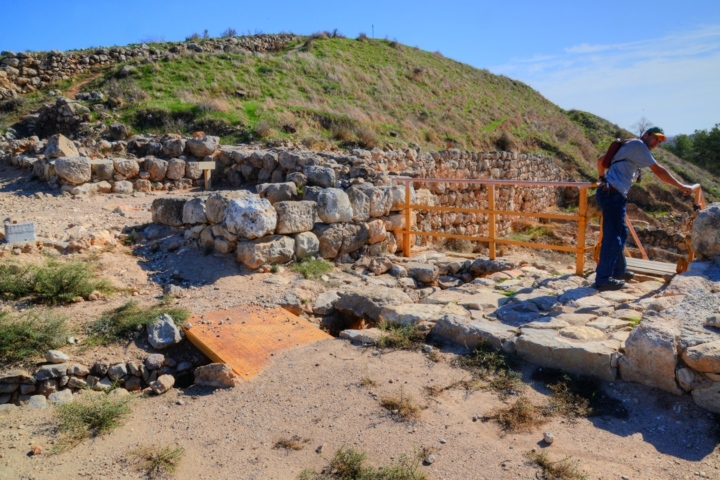 The temple is oriented with the entrance door facing the east side, therefore it was called "the Solar Shrine" by the excavator of Lachish. 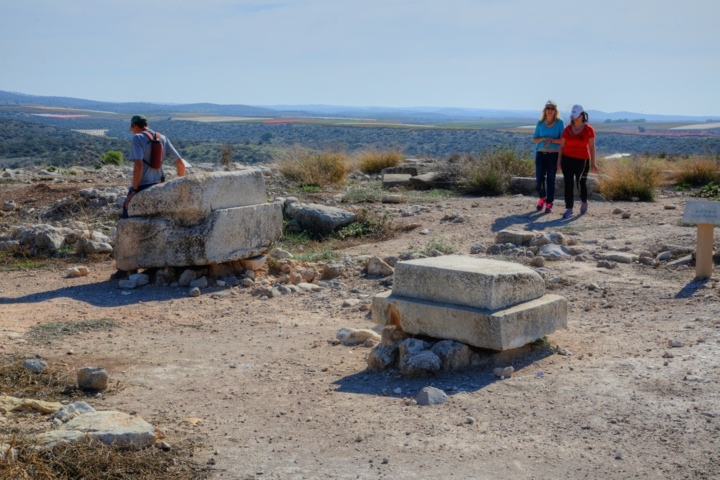 Y. Aharoni identified it as a 2nd-3rd C BC Jewish temple, which was founded during the Hellenistic period, during the time when the mound was partially occupied. This dating was based on Persian period ceramics that were found under the floor of the courtyard. Aharoni also found architectural similarities to a temple in Tel Arad he later excavated, with almost identical dimensions. In the center of the courtyard, on the right side of this photo, stood an altar stone with the "remains of a relief representing a human palm and the figure of a man with upraised hands preserved on both sides" (Y. Aharoni, Israel Exploration Journal 1968, p. 160). The three inner rooms of the shrine, seen in the following photo, are located on a raised elevation on the west side of the structure. This was the location of the Holy of Holies. Aharoni's excavation of the layer under the temple also revealed rich collection of clay bullae (seal impressions), vessels and weights, dated to the end of the Judean Monarchy. 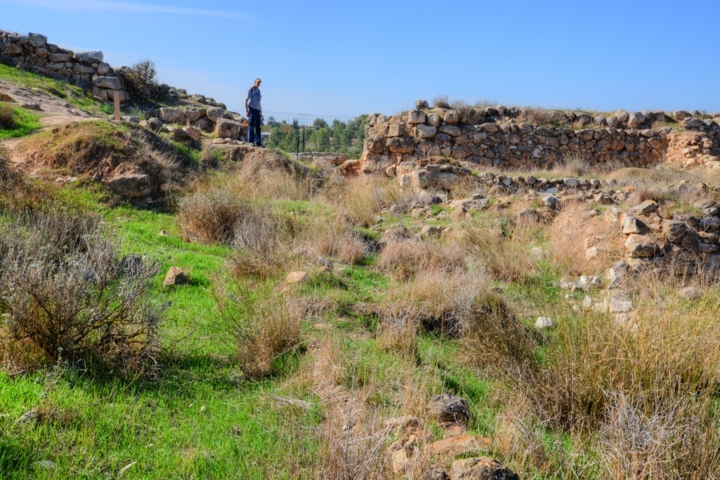 Adjacent to the west side of the temple are remains of the corner walls of the large courtyard of the Judean palace.. The national park planners laid out walking trails along sections of the mound. This trail leads from the center of mound towards the well. A deep (44m!) well is located on the north east corner of the mound. 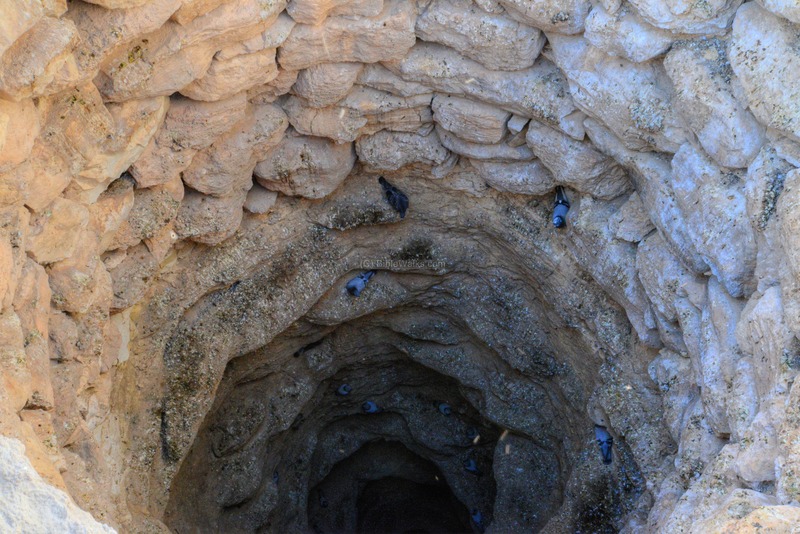 The location of the well is the closest from the top of the mound to the riverbed at the middle of the valley, where the ground water can be extracted. Its location is indicated on the right with a red circle. 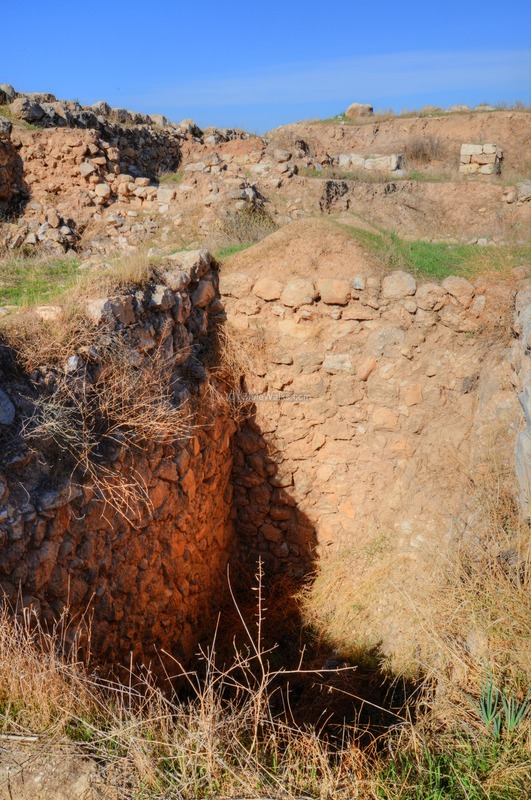 This well was the main water supply of the city, the source of life in ancient Lachish. Several steps lead down to the side of the well, just a few meters below the city wall. The well is also a home to dozens of pigeons. An ancient sacred Jujube (Sheisaf) tree, the only tree on the mound, is located near the well. 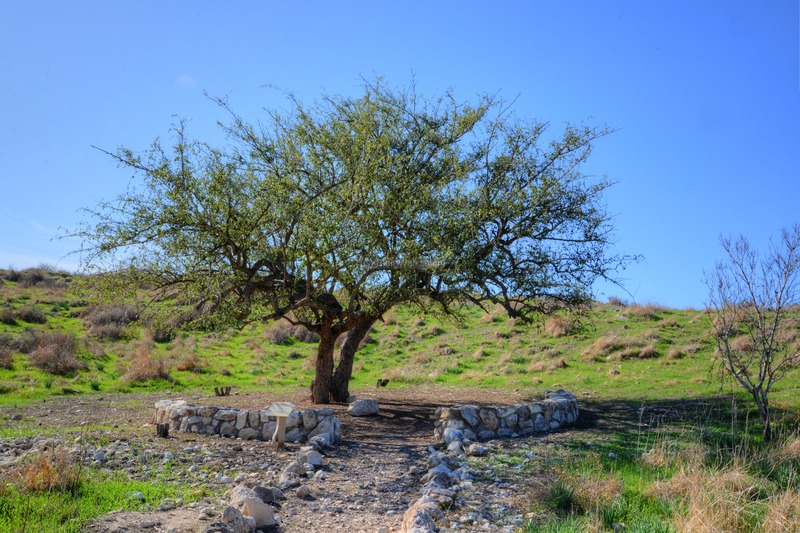 It is called the "goblin" tree, since the children of the nearby Arab village of el-Kubeibeh - who used to fetch their water from this well until 1948 - were told to hurry back with the water because of the demon inside the tree. To the south of the Solar Shrine is the "great shaft" - a large (25m x 22m) hewn hole, 22m deep. The shaft may have been a water cistern, although it s construction was probably not completed. In addition to the historical sights and Biblical references, the young visitors study the life of insects that they cross along the trail. On the north west corner is an impressive reconstruction of the city wall. Its location is indicated on the right with a red circle. The hill below it is of modern times, created by the accumulated soil from the Starkey excavations. The city wall was built along the peripheral of the top of the mound. Below it, at mid height, was another wall ("revetment" wall). It is seen in the following picture at the bottom of the corner supporting wall. Along these foothills was a stone-filled glacis. At the foot of the hillside was a moat (fosse). It can be seen on this western side at the bottom of the mound. A Canaanite temple was found in the moat level, on the right side of the following picture. This temple is named the "Fosse Temple" (or, "moat" temple). This Canaanite temple is dated to the 13th C BC (Late Bronze Age). Three levels were found in the temple, with rich findings. A 360 degrees panoramic view, as seen from the north west side, is shown in the following picture. If you press on it, a panoramic viewer will pop up. Using this flash-based panoramic viewer, you can move around and zoom in and out, and view the site in full screen mode. Hot spots indicate the major points of interest. To open the viewer, simply click on the photo below. It opens a new window, and will run after a minute or so. On the top of the mound are the remains of a monumental palace-fort of the Judean Kingdom, which covered earlier Middle Bronze and late Bronze palaces. Its location is indicated on the illustration with a red circle. The palace - the largest of its kind of this period - was the residence of the Judean governor, and the surrounding structures included garrisons for the soldiers, stables for several dozen horses, and iron chariots. Approaching the palace from the east side, the large wall can be seen on the top of the hill. The palace was located on top of this raised platform behind the wall, with an area of 37m wide by 78m long, and raised up to 10-11m high. In addition to the raised platform, the palace included structures on its west and south sides. A large (74m by 107m) courtyard was located on the east side of the palace (here, in the foreground), but most of it is now gone. It was lime-paved and encircled by a wall. According to D. Ussishkin, the courtyard was the training and parading area for the chariots and horses, and the southern annexed building were actually stables. A closer view of the eastern wall of the Judean palace-fort is shown below. This wall was widened during the 8th C BC, by adding another set of bricks along the earlier walls. A monumental staircase was added during that time on the east side. On the northwest side is another modern access to the palace, at the edge of the path that circles the north side of the mound. On the north side of the palace is the area of excavations named "Area P", where 5 levels were found under the Judean palace, and numbered as levels P-5 to level P-1. The archaeologists found in these levels two earlier palaces under the Judean palace (Late Bronze and Middle Bronze). The following photo is a view from the edge of the palace elevated floor, towards the north-east. An annexed (auxiliary) building is located on the north side of the palace, which contained storerooms. The structure of the building is composed of 6 long rectangular rooms, with opening on the east side (seen here on the right). Another similar building ("1034"), yet smaller in size, is located on the south east corner. Sections of the western wall reveal a seam between different construction periods. The raised palace platform was extended southwards (the right wall) in the end of the 10th C or beginning of the 9th C.
This extension was probably constructed by King Rehobam, son of Solomon, who fortified the city (2 Chronicles 11 5-12): "And Rehoboam dwelt in Jerusalem, and built cities for defense in Judah. 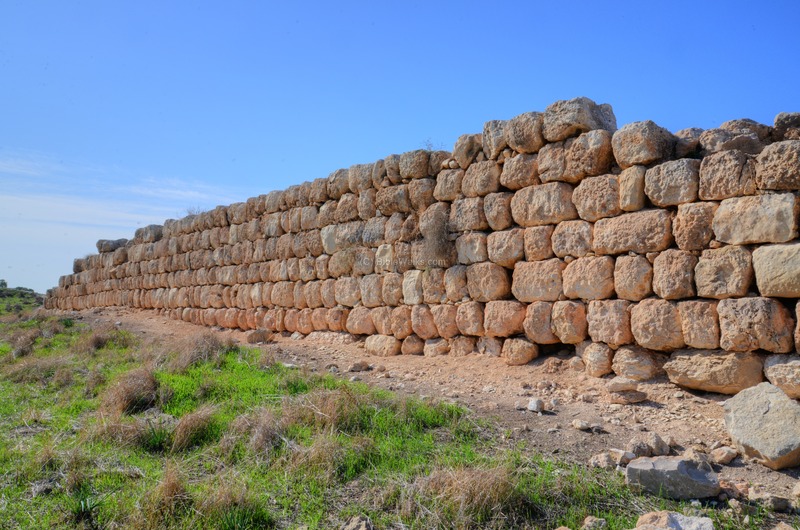 He built ... Lachish... And he fortified the strong holds, and put captains in them, and store of victual, and of oil and wine. And in every several city he put shields and spears, and made them exceeding strong...". Palace "B" was built after the Kingdom has split, at the end of the tenth or the beginning of the 9th C BC, and probably built by Rehobam. This palace extended the raised platform southwards by 22m, and added annexed buildings on the north and south sides. Palace "C" was extended in the 8th C: its eastern wall was widened, the southeastern annexed building was enlarged, and a large courtyard was added on the east side. These changes were, according to D. Ussishkin, in order to add stables and courtyard for the chariot training. 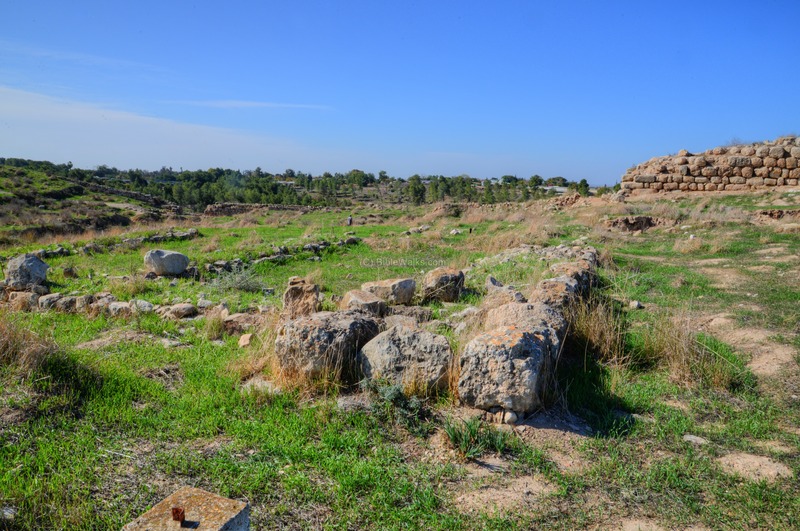 The monumental palace stood additional 4-5m above the raised platform, thus dominating the landscape of the Judean city. On the top are some remains of the monumental palace. The palace was reused during the Persian period, so the palace was reconstructed during that period. Most of the large stones have been robbed by the Arab villagers during the Ottoman period, and what was left is a fraction of the large palace. One can only imagine how this massive palace would have looked like. The raised platform was constructed above the earlier palaces, by filling the rooms with soil. This shaft on the north east corner shows one of the ancient rooms which was filled to build the floor of the palace above the earlier walls. A section of the north east corner, focusing on the top of the wall, is viewed in the following picture. 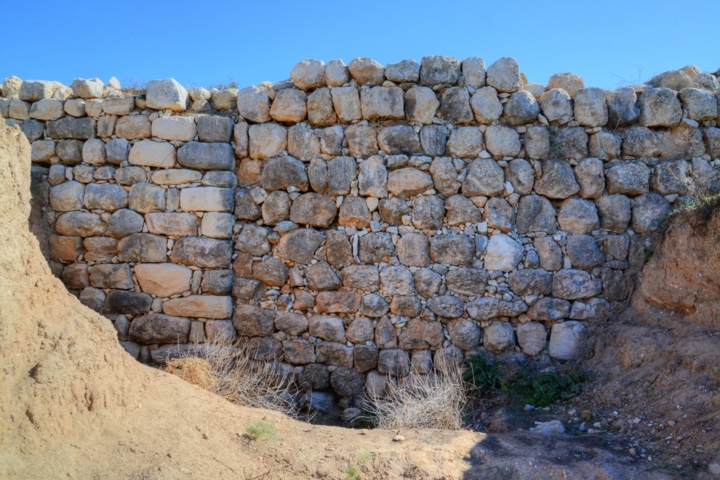 The two phases of construction of the wall are seen; the left side is of the earlier construction of Palace "B" while the right side is of Palace "C". The yard of the palace is located on its south side. The floor of the palace yard was covered by white plaster. Fragments of storage jars, dated to Hezekiah, were found on the south side. 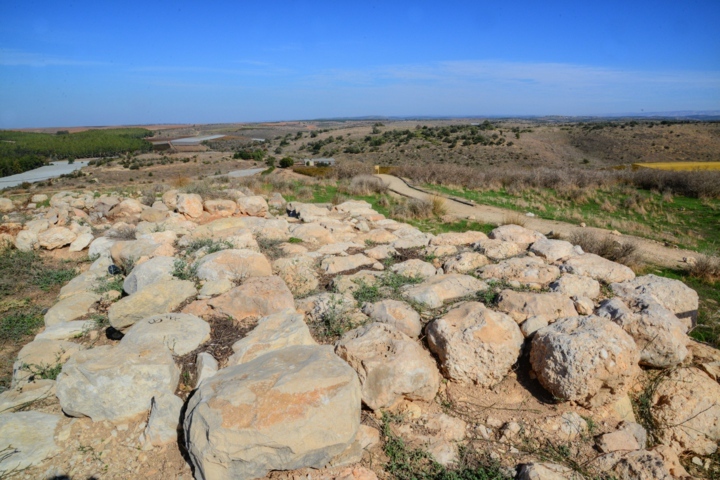 A 240 degrees panoramic view, as seen from the palace towards the south side of the mound, is shown in the following picture. If you press on it, a panoramic viewer will pop up. Using this flash-based panoramic viewer, you can move around and zoom in and out, and view the site in full screen mode. Hot spots indicate the major points of interest. 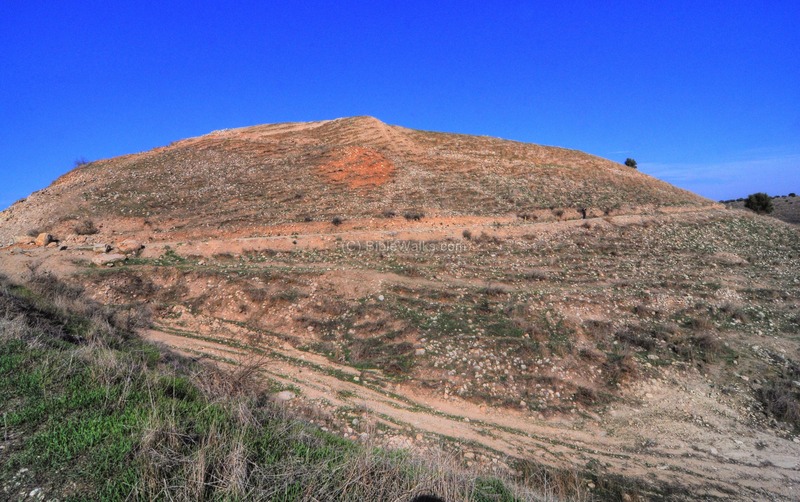 The south west side of Tel Lachish was the entrance to the city. A main street leads eastwards from the inner gate towards the center of the city and the palace. Its location is indicated on the illustration with a red circle. The following photo shows a view of the main street from the palace. The inner gate is located on the right side, and the street is located between the walls. On the north side of the street was a large residential building, located along the city wall on the north side of the inner gate (as in the following photo). It is dated to the 6th C BC (level II), and composed of a large courtyard extended in front of two rooms. A broken Ostracon was found in the south room, with a possible list of names. A large reservoir was located under the courtyard, fed by a stone built channel running out of the house. On the west side of the city was the main (and only) gate. It was constructed during the 10th C BC (level IV) and continued to be in use until the 6th C BC (level II). This photo shows the inner side of the gate, which was an opening of the city walls. Two towers flanked both sides of the inner gate. Three chambers were located on each side of the street entering into the main street of the city. 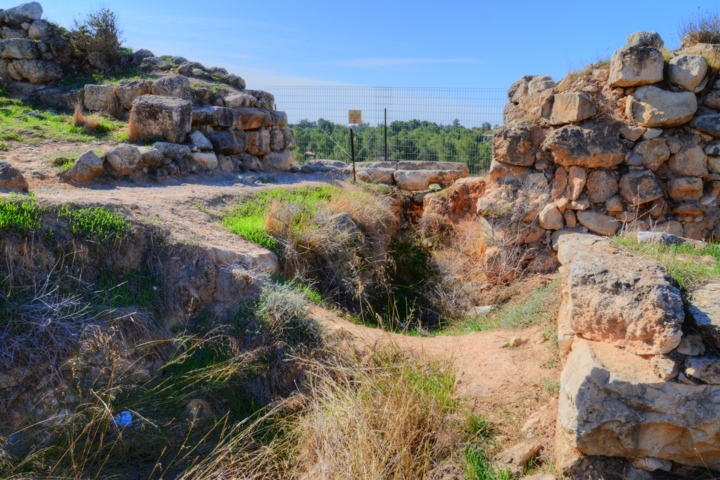 The triple chamber was a common design during the Israelite Kingdom. The threshold stones of the inner gate are seen here in closer detail. The plan of the gate complex was rectangular, with a spacious paved courtyard in its center. Two towers were located on the inner (east) side, along the wall of the city. One or two towers were located on the outer (west) side. 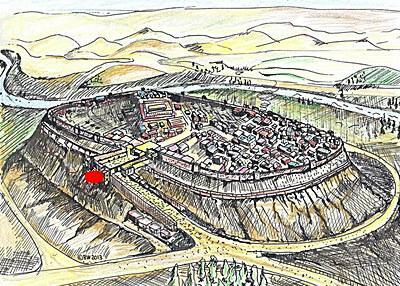 The location of the west gate complex is indicated on the illustration with a red circle. The courtyard is located between the outer and inner towers. The wall and the inner gate is seen in the following picture from the west. A drain crossed the center of the courtyard, built under the pavement of the courtyard. It drained the runoff water out of the city and to the external road. A closer view of the inner gate is seen below. The main city wall, about 5.7m thick, flanks the gate on both sides. It was built of brick on stone foundations, and its inner face was white plastered. Along the sides of the courtyard were rows of rooms, three on each side. The photo below shows the northern side of the courtyard. The archaeologists suggested that the rooms along the wall has a dual purpose - administration role during peaceful times, and defensive during an attack. The next picture shows a view from the inner gate towards the outer gate, with the courtyard in the center. On the left (south) side of the courtyard was another row of rooms. In one of these rooms the excavators discovered an important finding. The remains seen in the following photo are a reconstruction of the Level II outer gate (586/7 BC), when the Babylonians destroyed the city. This gate was built on top of an earlier destroyed gate (levels III and IV) and adapted to their structures. Two towers were located on its external side: a north-west tower (which is missing), and a south-west outer tower which was reconstructed and seen below on the right side. This tower was first built during the 10th C BC (level IV) and continued to be part of the city defenses until the Babylonian conquest (level II). The drain from the inner gate ran down the courtyard, passed under the threshold of the outer gate (marked as wall w769), then continued down the external road pass the outer gate. Inside one of the level II guardrooms, seen below, the archaeologists found one of the important findings of the Starkey excavation of 1934: twenty one letters, dated to the Babylonian conquest (587 BC), written in ancient Hebrew script. 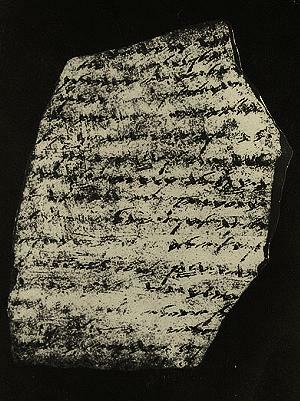 These "Ostracon" (piece of ceramics with writings) are written with carbon ink on broken clay pots. 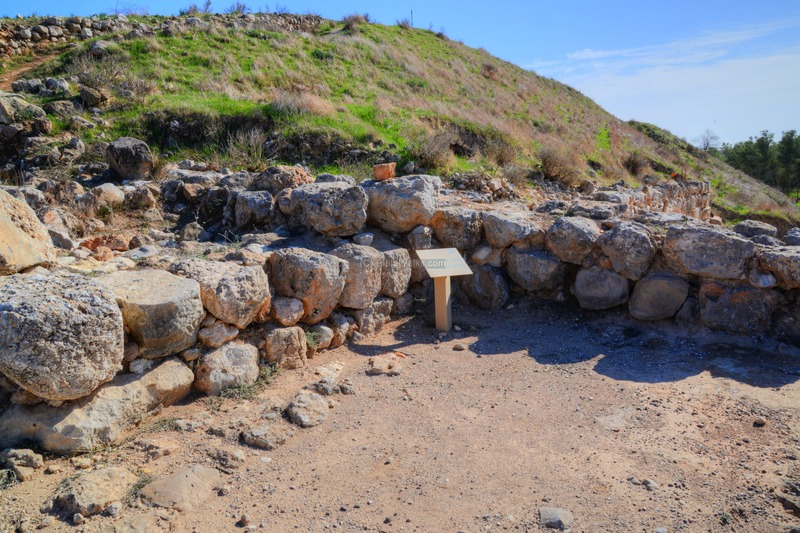 The letters were written by Hoshayahu, probably a commander of one of the outposts near Lachish, to his commander Yaush, which was stationed in Lachish. 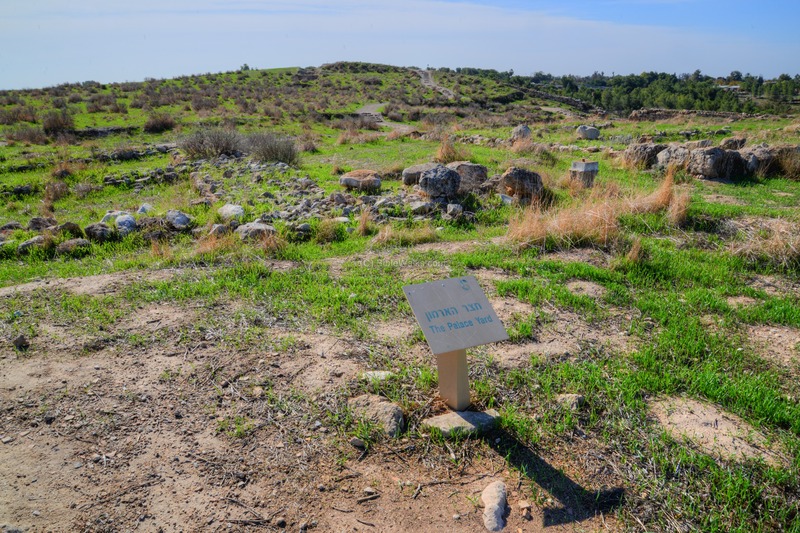 One of the letters (#4) was an early warning to the defenders of Lachish: it tells about the fall of Azekah, another stronghold of the Kingdom of Judah, which protected its western border along the valley of Elah. 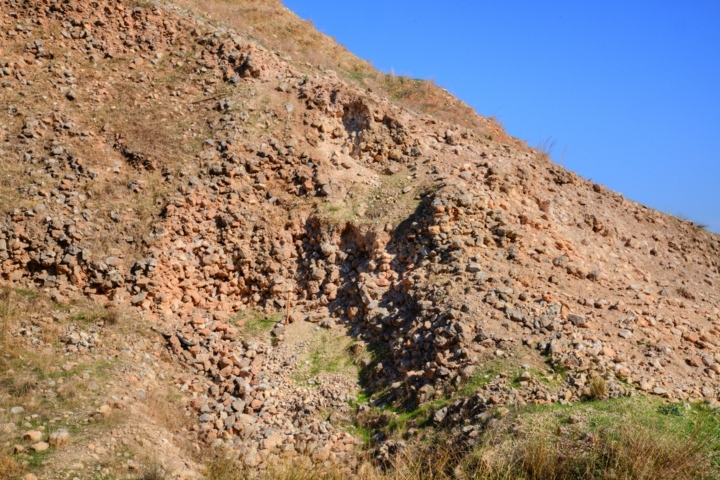 According to the letter, the fire signaling from Azekah to the outpost has stopped, indicating that it fell to the Babylonians. A closer view of the south-west outer tower is seen in the following picture. The sharp turn from the inner side of the gate to the external road was intended to slow down the attackers in case they penetrated the outer gate. The city gate started restoration in 1985, in order to present the city gate to the non-professional visitors. In most archaeological excavations, the ancient mound is peeled layer after layer and leaves most of the site devastated. 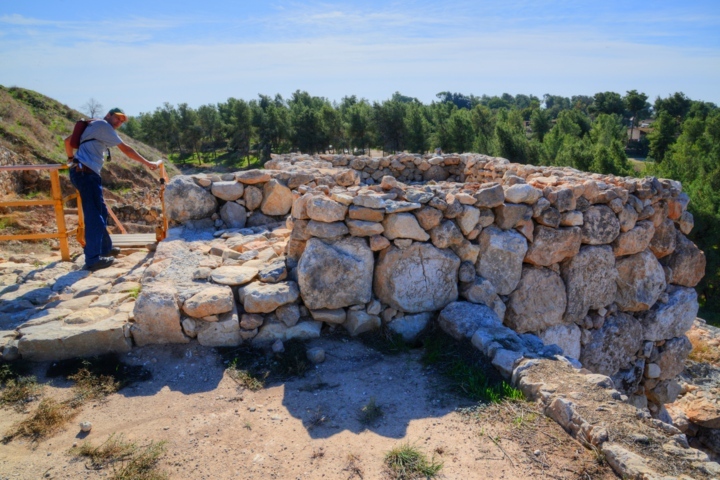 The restoration phase is an important step to enhance the look of the excavated site and make it easier to understand the life of the ancient times and relate them to the historical events. There are plans to continue restoring the external gateway as well. After the Starkey excavation, the tower was still standing to a height of 10 feet. But it later collapsed. The restoration was based on old photographs in order to reassemble the massive stone of the tower. 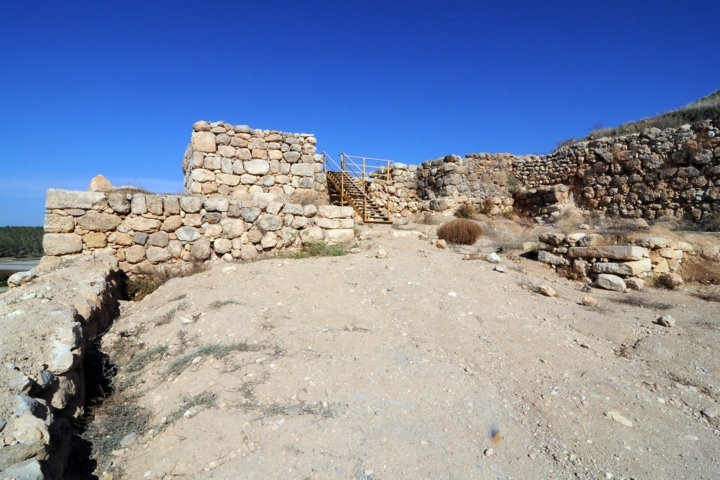 A 360 degrees panoramic view, as seen from the outer gate, is shown in the following picture. If you press on it, a panoramic viewer will pop up. Using this flash-based panoramic viewer, you can move around and zoom in and out, and view the site in full screen mode. Hot spots indicate the major points of interest. The external road descends from the outer gate, down to the south. Its location is indicated on the illustration with a red circle. 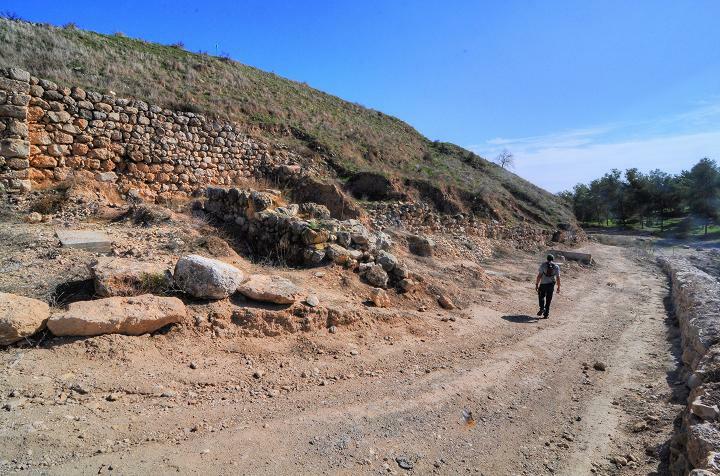 The road is flanked by the external wall (left side of the picture below) and the outer revetment (mid-slope) wall (right side). Both walls are dated to Level II (6th C BC). The road was covered with a layer of charcoal, ashes and burnt brick, and iron arrow heads - remains of the final burning of the city after the Babylonian conquest. 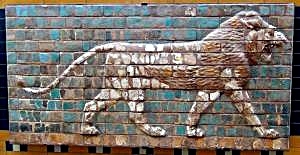 The Babylonians used fire for their conquests, rather than battering rams along siege ramps to knock down the defensive walls. 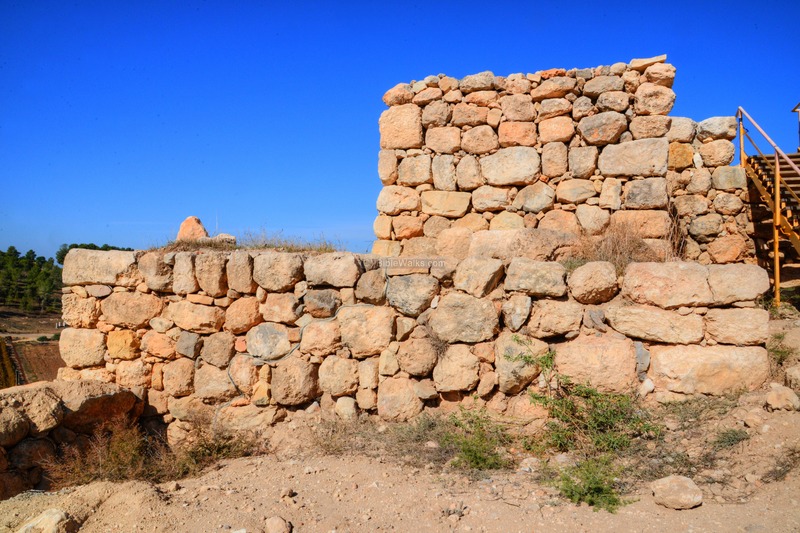 They laid wood and brush along the supporting walls, and the fire caused the stones to crack, thus tumbling the walls. The external road continues toward the south, along a lower eastern wall. In the far side of the road you can notice that the slope of the hill extended into the road. 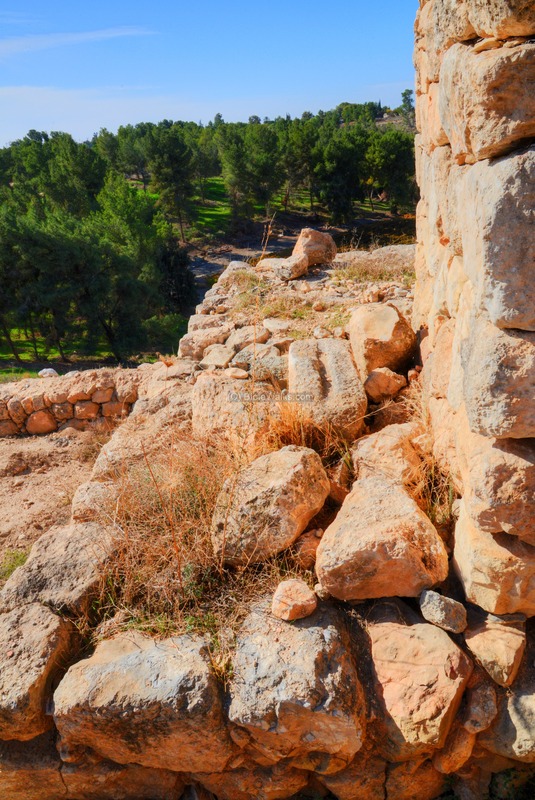 This was part of a siege ramp that was constructed by the Assyrians during the campaign of 701BC. 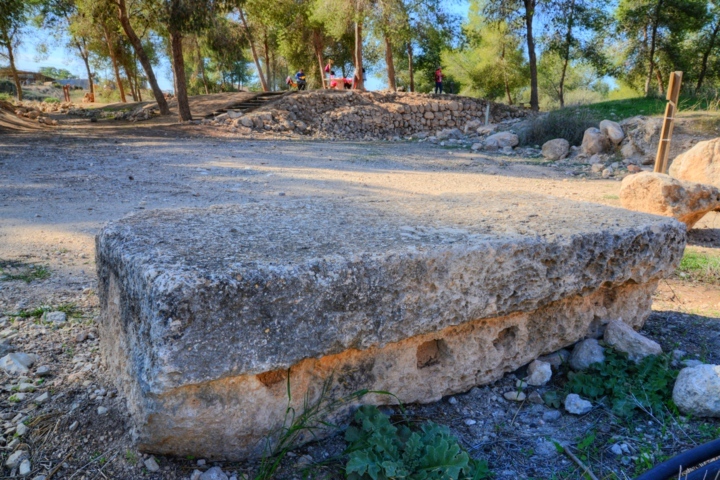 A large section of the siege ramp was removed during the excavations, in order to reveal the full extent of the road. 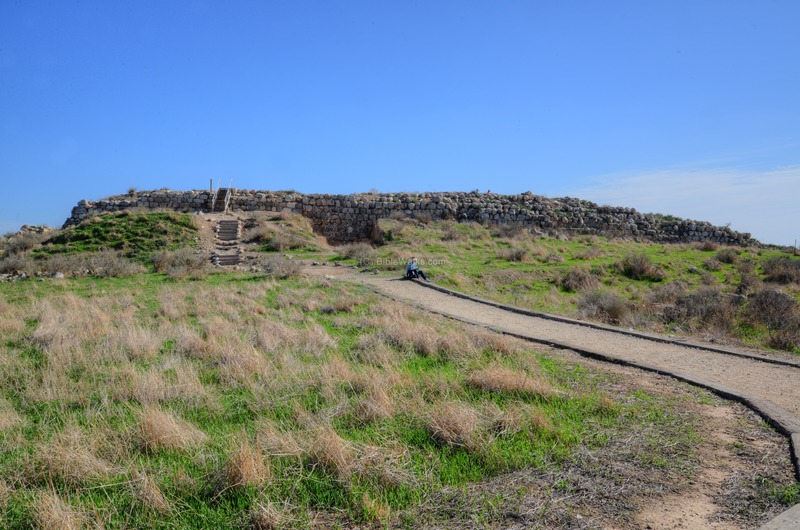 This huge siege ramp is built on the southwest side of Tel Lachish, as seen from the south side. 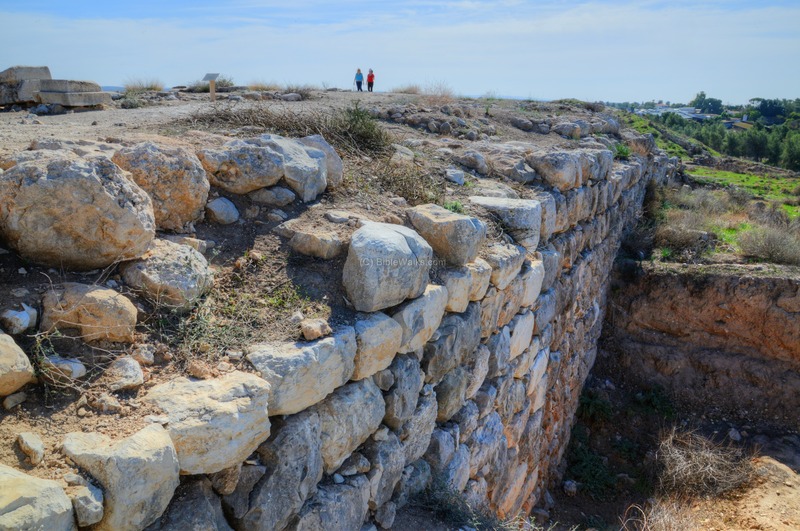 Its size is estimated at 70-75m wide at the base, a length along the central axis of 50-60m up to the outer revetment wall (a mid-slope wall at a lower level than the city wall, which may have been the first line of defense). The width of the ramp on the outer revetment wall, was 25m - sufficient to hold 5 battering rams as illustrated in the Assyrian relief structure. According to the excavation findings, the ramp was constructed in two phases: the first ramp reached to the outer revetment wall, but then was burnt and the structure collapsed. 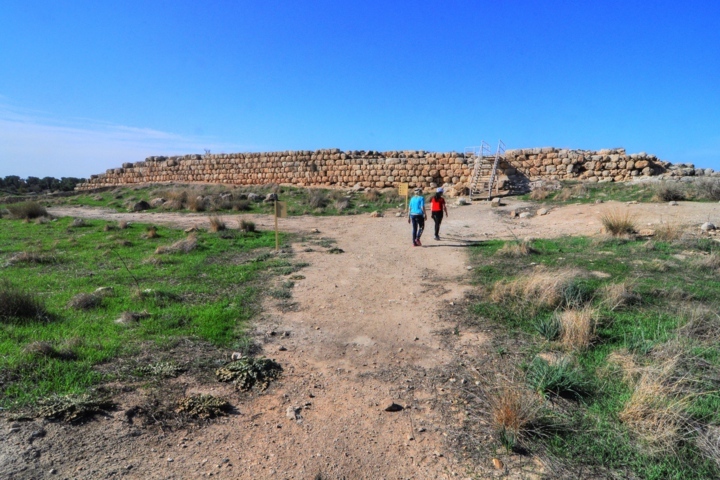 In the second stage the ramp was increased to the top of the city wall, which allowed the Assyrians to finally penetrate into the city. A narrow trench was cut into the siege ramp. It is composed of large heaps of stones. The area had traces of burning, numerous iron arrowheads and sling stones, testifying to the fierce battle along the siege ramp. 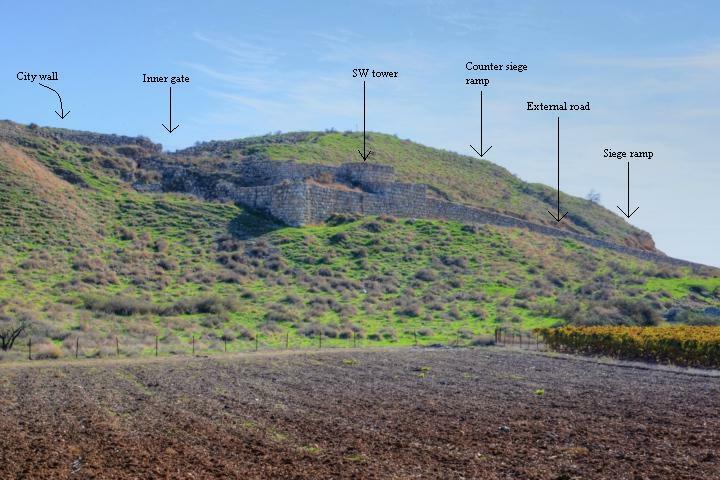 During the construction of the siege ramp, the defenders attempted to build a higher counter-ramp on its north side, 3m higher than the city wall, as a second line of defense. This can be seen on the south side of the inner gate. 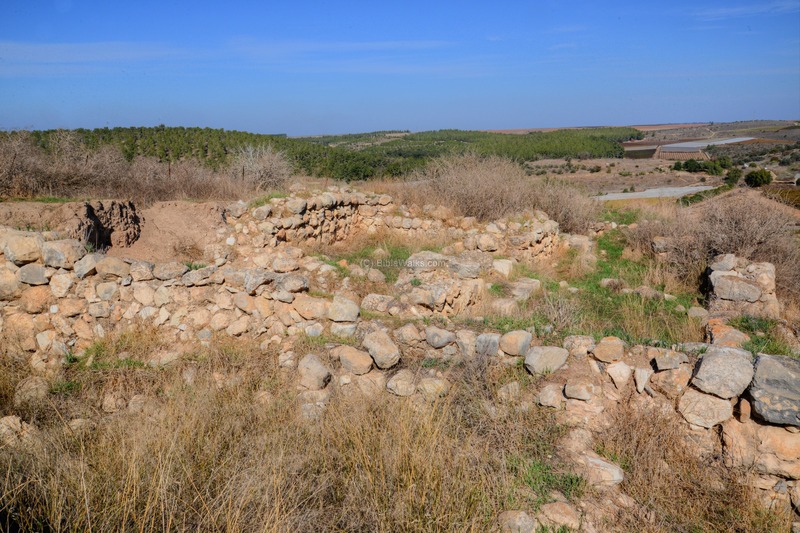 The Biblical Hebrew term "Amad ba-peretz" refers to the state when the wall is breached, yet the defender blocks the passage into the city (Psalms 106, 23): "Therefore he said that he would destroy them, had not Moses his chosen stood before him in the breach, to turn away his wrath, lest he should destroy them". The photo below shows a section of the city walls on the south side of the inner gate. The area to the south is higher than the original wall, where the counter-ramp was raised. 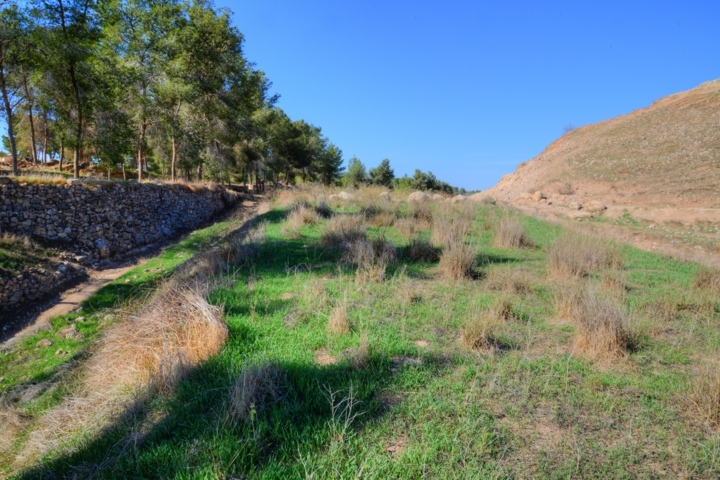 The soil was dumped against the face of the city wall during the 701BC Assyrian assault, creating a 120m long, 35m wide crescent shaped hill above the Level IV-III wall. A summary of the south west complex is shown in the next picture. The external road continues to the south. Along the road, near the visitors parking lot, are some monumental stones. 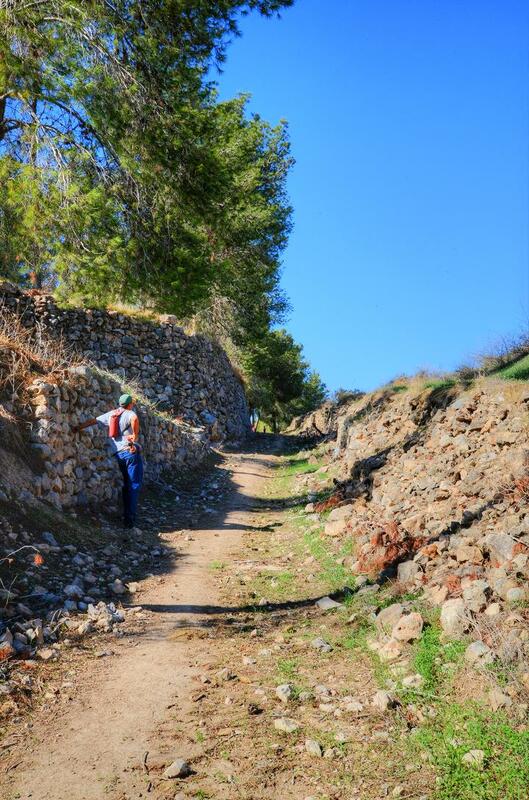 Yet another section of the road, passing through a set of walls. A drone aerial view, flying along the south side, can be played with the following YouTube video. Tell ed Duweir - Arabic name of the hill, as seen on the PEF map. Duweir - Arabic for "small-round", perhaps the name is "the small round mound". Tell el Kubeibeh - Arabic name, based on the nearby village. Arabic for "small cape". 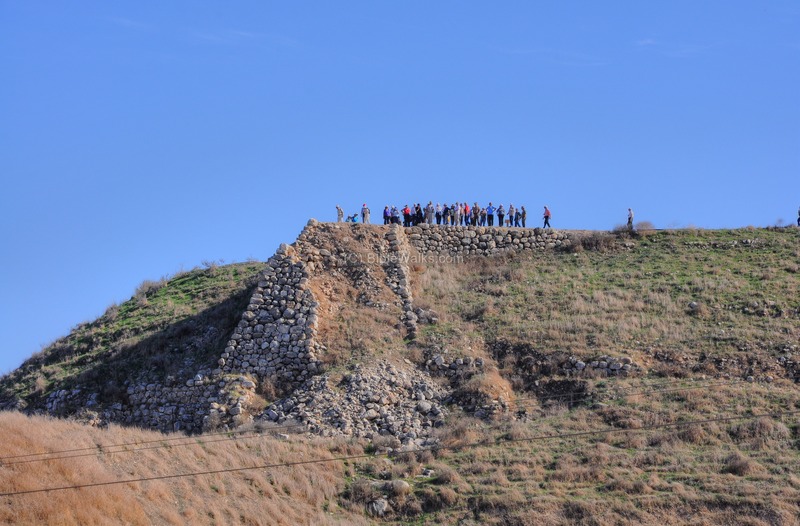 Lachish / Lakhish - Biblical name of the Canaanite city, first referred in the battles of Joshua (Joshua 10 5): "Therefore the five kings of the Amorites... the king of Lachish... ". The meaning of Lachish is not known, perhaps based on the root word "lechesh" - raffia made of palm tree fibers (from the Talmud). Wadi el-Ghufr (or Ghafr) - valley of the "young of the mountain goat"
New gate discovered at Tel Lachish in the northeast side, opposite to the Iron Age gate. 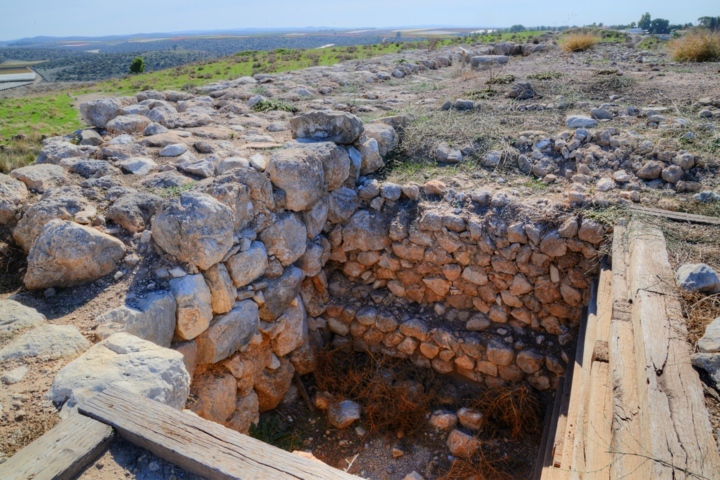 The gate is dated to Middle Bronze period (as first found in season 2014).